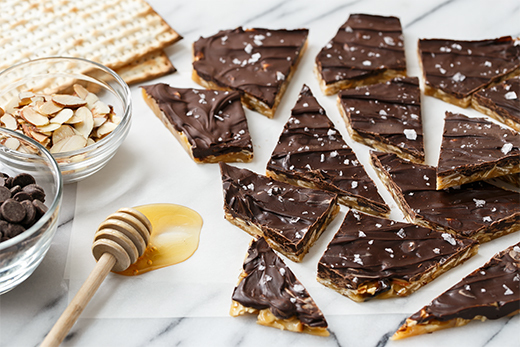 A perfect sweet snack for Passover, this matzo bark features crushed matzo and slivered almonds enrobed in a sweet honey toffee. It’s both crunchy and sticky, sweet and salty, and downright delicious. Line an 8-by-8-inch baking pan with parchment paper or aluminum foil. If using foil, generously butter the foil (parchment paper is naturally nonstick). Set aside. 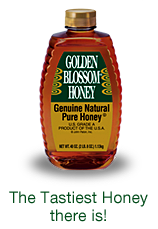 Combine honey and butter in a 2 or 3 quart heavy-bottomed saucepan. Stir over medium heat until butter is melted and mixture begins to boil. Insert a candy thermometer into the bubbling mixture and continue to cook, swirling the pan occasionally to prevent scorching, until it is deep amber in color and measures 275-285ºF, about 8 minutes. Remove from heat and add vanilla extract (be careful as it will spatter). Stir in crumbled matzo pieces and slivered almonds until evenly coated. Pour into prepared baking pan and spread into an even layer. Sprinkle chocolate chips evenly over top of hot candy. Let sit for 5 minutes, then spread into an even layer using an offset spatula. Sprinkle with sea salt. Let cool for 1 to 2 hours or until set, then cut or break into bite size pieces to serve. Store in an airtight container.